The graffiti scrawled across the front windows of the Spokane County GOP office is not being investigated as a hate crime, despite original reports. "It doesn't meet the requirements of a hate crime," says Spokane Police Capt. Brad Arleth, who is in charge of the police investigations division. "I think right now with everything going on across the country, there's a little bit of confusion. People start throwing around the term 'hate crime' for things that are politically motivated or motivated by a difference of opinion, but that doesn't fall under the hate crime statute." The crime is being investigated, though, as malicious mischief — a misdemeanor. 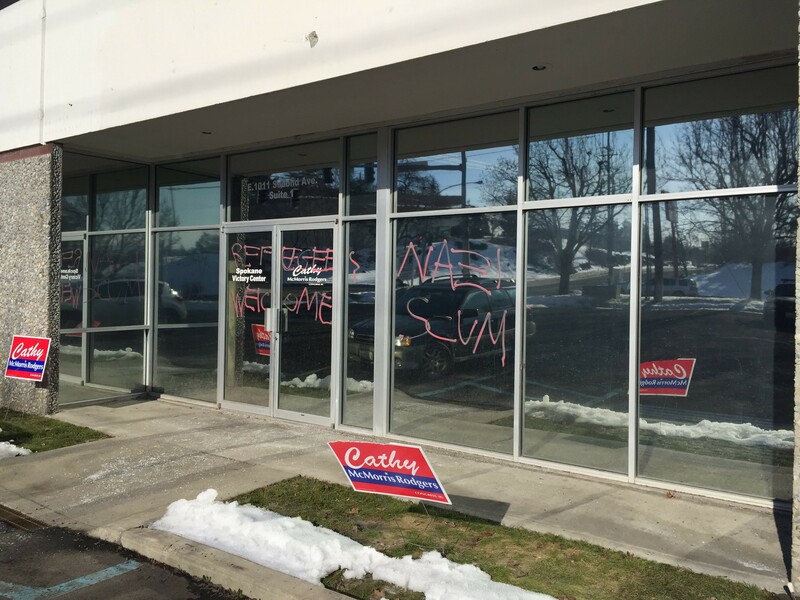 Stephanie Cates, the Spokane County GOP chairwoman, posted about the graffiti on the Spokane GOP website Sunday, Jan. 29. "Refugees welcome" and "Nazi Scum" was written across the office's windows. She announced that she filed a report with the Spokane police, and questioned whether vandalism motivated by political affiliation should be considered a hate crime. "Acts of vandalism motivated by race or religion are classified by the police as 'malicious harassment' — and commonly known as 'hate crimes,'" Cates wrote. "This incident brings up the issue of whether such attacks motivated by political affiliation should be included in that classification. One should not have to fear their personal safety, nor suffer destruction of personal property, because of their political beliefs." The Spokane County Democratic Party, of which civil rights attorney Andrew Biviano is chairman, condemned the vandalism in a statement, saying, "this type of behavior is never acceptable. We call on people to actively engage in civic life, without hatred, violence or fear." Spokane police initially indicated to the Spokesman-Review and KREM 2 that they were investigating the vandalism as a hate crime. But a hate crime in Washington state, also known as "malicious harassment," must be motivated by the victim's race, color, religion, ancestry, national origin, gender, sexual orientation or mental, physical or sensory handicap. Political ideology, such as Nazism or conservatism, does not count. Biviano says calling the vandalism to the GOP office a hate crime is not only wrong, but it misrepresents the original intent of the hate crimes law. "I think that it reflects a misunderstanding of what the purpose of hate crimes legislation is: To remedy generations and centuries of institutionalized oppression and terrorism of powerless groups," Biviano says. He says there is no historical problem of political parties being the victim of systematic oppression.